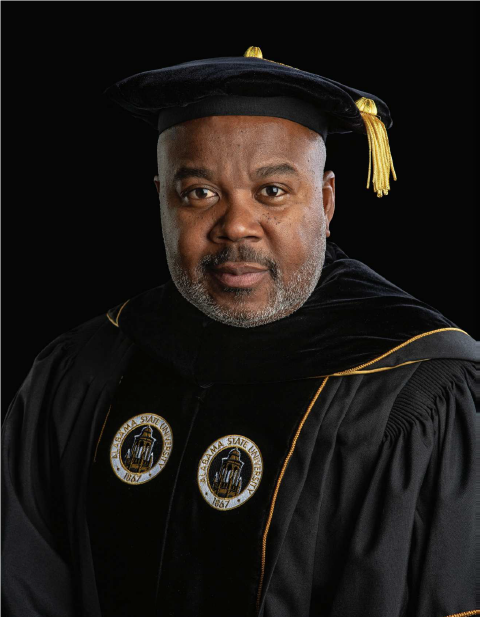 Dr. Quinton T. Ross Jr.
Dr. Quinton T. Ross, Jr., currently serves as the 15th President of Alabama State University. Prior to becoming President of his alma mater, he had begun his fourth term in the Alabama State Senate after having been elected to his first term in 2002. While serving in the Senate, Dr. Ross distinguished himself as a true statesman and was one of seven African Americans serving in the Alabama State Senate. 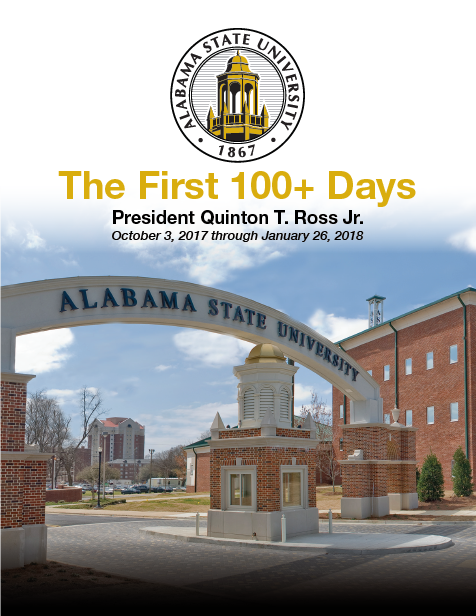 Alabama State University is governed by its Board of Trustees, Office of the President and Office of the Provost and Vice President for Academic Affairs. Members of the University's Administrative Council advise the University president and provide leadership with regard to University policies, practices and initiatives. 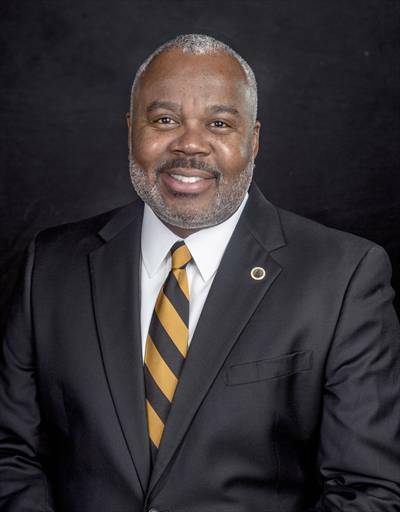 The administrative offices of Alabama State University are charged with managing the various institutional resources required to advance the University's mission and goals. These administrative divisions provide day-to-day management of the University's financial, physical and human operations, and are directed by vice presidents and directors who report directly to the Office of the President. View the University's Organizational Chart. 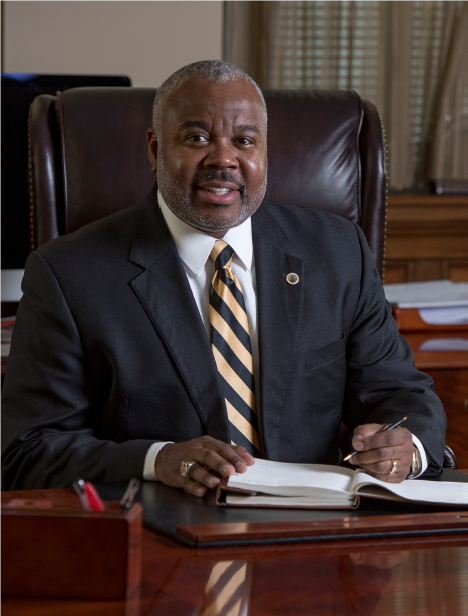 Dr. Quinton T. Ross, Jr. is the President of Alabama State University. Read Dr. Ross' full bio. 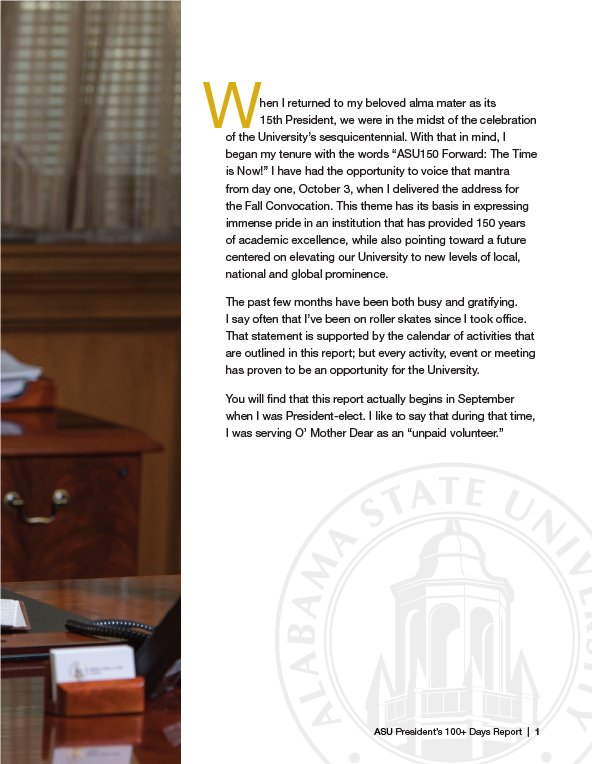 The Alabama State University Board of Trustees has legal authority, control, and responsibility for governance of the university in the areas of institutional mission, fiscal stability, institutional policy and related foundations and corporate entities that support the institution and its programs. 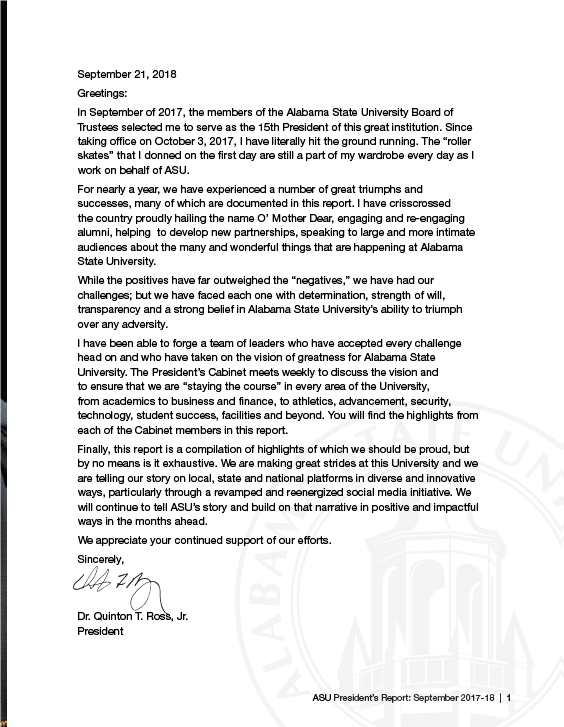 Carl Pettis serves as ASU's Provost and Vice President for Academic Affairs. 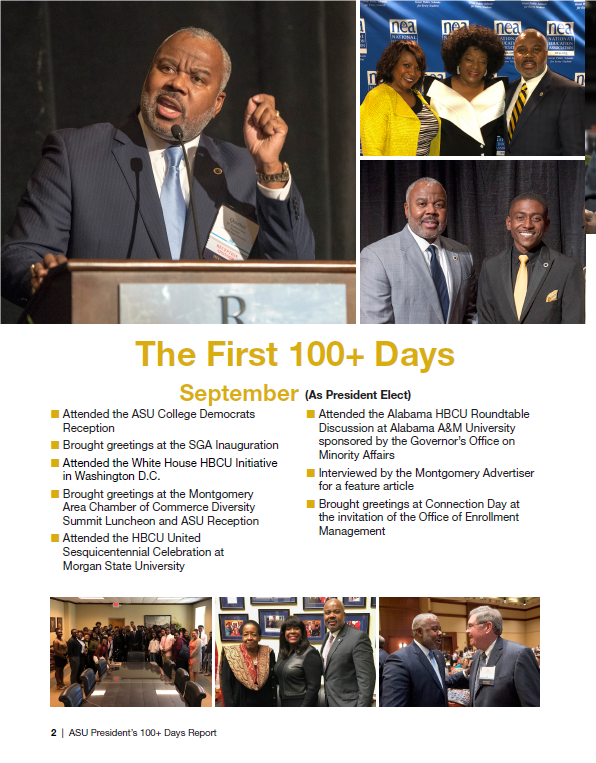 The Alabama State University Administrative Council advises the university president and provides leadership with regard to university policies, practices and initiatives. Alabama State University’s various administrative offices are charged with managing the various institutional resources required to advance the University's mission and goals. These administrative divisions provide day-to-day management of the University's financial, physical and human operations. 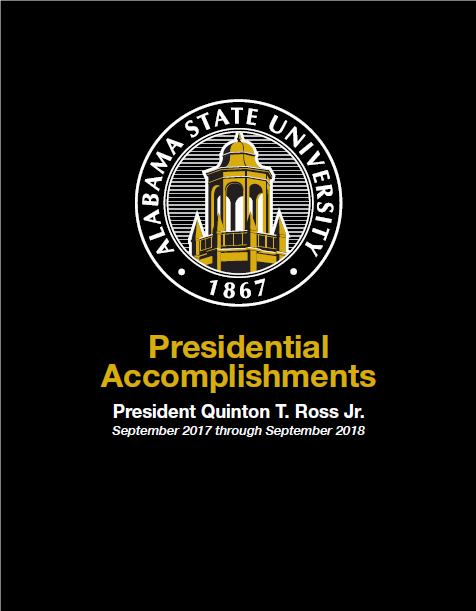 About Dr. Quinton T. Ross Jr.
Dr. Quinton T. Ross, Jr., currently serves as the 15th President of Alabama State University. Prior to becoming President of his alma mater, he had begun his fourth term in the Alabama State Senate after having been elected to his first term in 2002. While serving in the Senate, Dr. Ross distinguished himself as a true statesman and was one of seven African Americans serving in the Alabama State Senate. In 2015, he was elected as the first African American male Senate Minority Leader and the first Minority Leader elected to a four-year term. During his service, Dr. Ross was an established legislative leader and an unwavering advocate for public education, issues dealing with child safety and the general welfare of all Alabamians. Throughout his legislative tenure, Dr. Ross served on numerous committees, including Bank and Insurance, Confirmation, County and Municipal Government, Transportation and Energy, Military Affairs and the powerful Finance and Taxation Education Committee. He also was Vice-Chair of the Education Youth Affairs Committee. Prior to becoming an educator or being elected to office, Dr. Ross was a Statewide Field Representative for the Alabama Democratic Party and the Alabama Democratic Conference for a number of years. He has held key positions in numerous political campaigns. Ross served as Co-Chair of the State Advisory Committee for President Barack Obama’s first election. Dr. Ross has received numerous awards and recognitions and has been featured in many publications. He has been honored for his commitment to equity and quality in education. Ross has received The Montgomery Advertiser King Spirit Award, K.E.E.P. Production’s Young Legend Award and the Daring to Make a Difference Community Service Award. Ross received the Alabama School Board Association’s Power of One Award (2009) and recognition by Omega Psi Phi Fraternity, Inc., locally, statewide and district wide as Citizen of the Year (2011). Other awards include the Alabama Adult Education Director’s Association 2012 Champion Award, 2015 Citizen of the Year for the Montgomery Alumni Chapter of Delta Sigma Theta and the 2016 Beloved Community Award from the Alabama State University Friends of the Theatre. Dr. Ross also was selected by the Business Council of Alabama as a 2017 Business Champion. Dr. Ross holds professional memberships in several organizations, such as the National Education Association, National Council of Higher Education. Alabama Education Association, Omega Psi Phi Fraternity, Inc., and 100 Black Men, Inc. He is a member of Hutchinson Missionary Baptist Church and its male chorus. His most notable accomplishment is being a loving husband and father of two sons.